Edelbrock Nitrous System - EFI Dry System UNIVERSAL - MiataRoadster - Stay tuned with MiataRoadster! 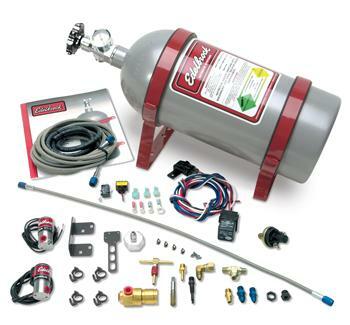 Edelbrock is known for innovative products, and our new Nitrous Systems are no exception. All Edelbrock Nitrous Systems are dyno-tested and calibrated to deliver accurate and safe horsepower gains with even distribution to each cylinder. Our nitrous calibrations are determined through dyno-testing, not simple mathematical formulas, which do not take into account real-world variables. Performer Nitrous Systems are the best way to get a major power increase in your Sport Compact. The nitrous system interfaces with the OE fuel system and increases fuel flow to the existing fuel injectors when the system is armed & triggered. Nitrous is metered by tuning jets and injected through a dry nozzle (no fuel) into the incoming air charge. This nitrous system interfaces with the OE fuel system and will increase fuel flow to the existing fuel injectors when the system is armed and triggered. Performer EFI Nitrous Systems are the best way to get a major power increase in your fuel injected late-model street machine. These systems work with your stock ECU for a simple installation.